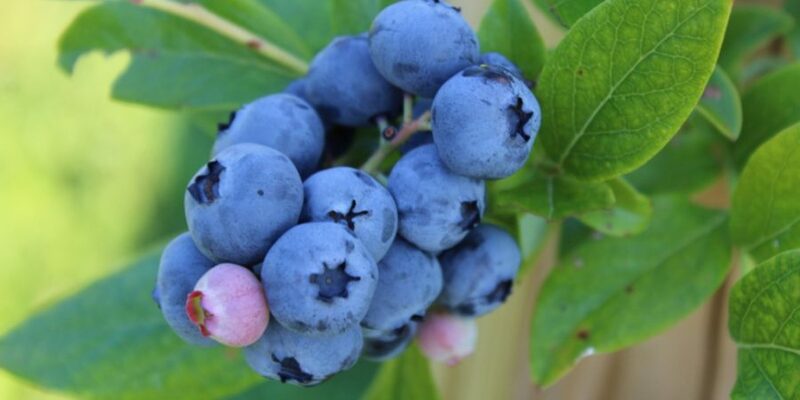 Forty or fifty years ago, someone who lived on our property planted blueberry bushes. The plants are now so large we stand on a ladder to pick the tops of them. Most years, we pick between twenty and thirty gallons. And every year, I am grateful to Jesus and that person. Here’s how our family enjoys them. 1. Eat fresh, by the handful. 2. Serve in a pie. 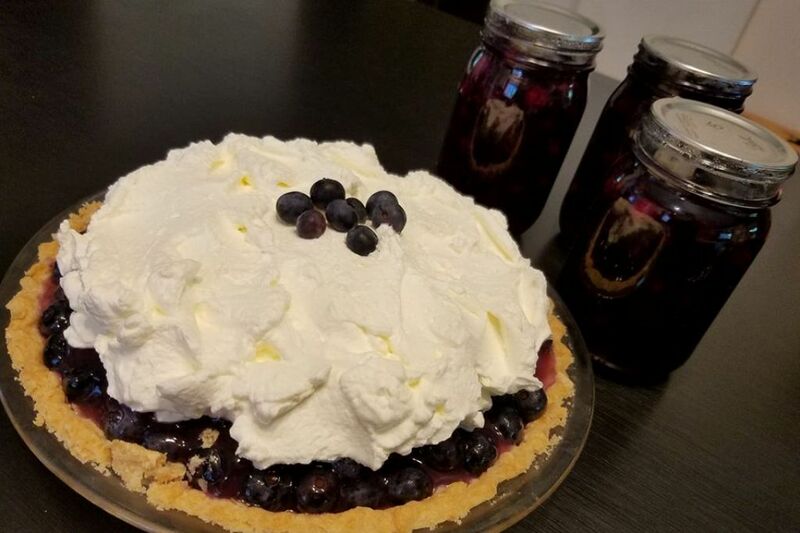 My mother’s recipe has three to four ounces of cream cheese spread over a pre-baked crust, followed by pie filling, followed by mounds of whipped cream. Mmm. 3. Freeze as they are, in quart containers. All winter, we will add them to pancakes, muffins, milkshakes, and desserts. Honey Bunches of Oats is my favorite, sometimes with banana slices and a light drizzle of extra honey. 5. Can into pie filling. This is new for me in 2018. I’ve made fresh pie filling for years, but I’ve never canned any for later. My friend Rosetta gave me a killer recipe, as follows. It’s delicious over waffles or ice cream, or in delights and pies. I’m not a big water-bath canner, so I oven-canned mine. Bring to a boil and then drain through a strainer to remove berry pulp, saving juice. Stir together, then add to juice and cook till thickened. Ladle into pint jars. Water bath 25 min or oven can at 250 degrees for one hour. Yield: 1 quart – I quadrupled the recipe each time I made it. 6. Stir into all other fresh fruits. 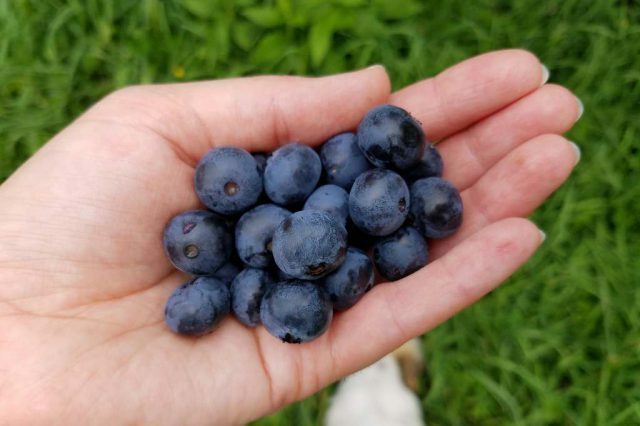 There’s just something about blueberries… We like them with watermelon, peach slices, kiwi, other berries, and/or mixtures of all of the above. 7. Bake into cobbler or crisp. Who says easy as pie? Cobbler wins, hands down – my cobbler batter has only four ingredients. But my husband who is Not the Boss But Still in Charge loves the oatmeal crumbs on top of crisp, so we eat that too, with whipped cream or milk. Melt one stick of real butter in a 9×9 pan. Stir together; pour over melted butter; top with 3-4 cups of fruit. Bake at 325 degrees for 45-60 min till very golden-brown. Extra! Extra! : The first time I met Ryan’s parents, Oregon blackberries were in season. I wanted to impress the prospective in-laws with my culinary skills, so I phoned my sister back in Ohio and had her read me the recipe for this cobbler. But mid-call, with Ryan’s mother in the next room, my sis and I got the giggles, probably over some slip-up or mispronunciation. We laughed until we couldn’t breathe, me trying frantically to hold it in so the Zooks wouldn’t think I was the silly, giddy, brainless kind of person I was being at that moment. When we were done I hung up and baked the cobbler. My dad-in-law still remembers it, and I married his son a few months later; so I guess it did the trick. 8. Throw over anything else we’re eating, including salad. My brother Josh thinks salad with fruit is not salad, but pooh pooh to him. This week I picked kale from my garden and chopped it finely, then topped it with blueberries, craisins, sunflower seeds, and a poppy seed dressing. My kids groused a little, but I thought it was scrummy. But number one is still the best. Ever. Especially when sun-warmed. Do you have a good blueberry recipe for me to try? Not the boss, but Still in Charge…love it!! Psst, the first 3 words are the best!! ? Well…i do not remember the phone call. But it has me chortling. We got “the giggles” A LOT… Doesn’t surprise me. ? I’m looking for ideas on how to protect the berries from birds. We deploy mesh netting, but it has to be removed each year or the snow weighs down the netting on top of the branches. And none of the netting sizes commercially available fits the profile of our bushes. So it’s a mishmash of torn netting and exposed berries. Build cages? Build arch supports? Arm kids with shotguns? How do you all protect your berries? Have you ever made Burnt Blueberries? Like Burnt Grapes. Delicious. #1 is my favorite. We have a lovely blueberry patch not far away that we go pick at. But I love my fresh blueberry pie recipe. One of my favorite ways of eating frozen blueberries is pouring a little bit of French Vanilla Creamer on them, then covering them with heavy whipping cream (fresh cream would be heavenly but we don’t have access to fresh milk). The cream freezes on the berries and makes a delicious, refreshing treat! I’ll eat a bowl full for my breakfast, if I am lucky enough to catch them on sale somewhere and can afford to buy enough to freeze. 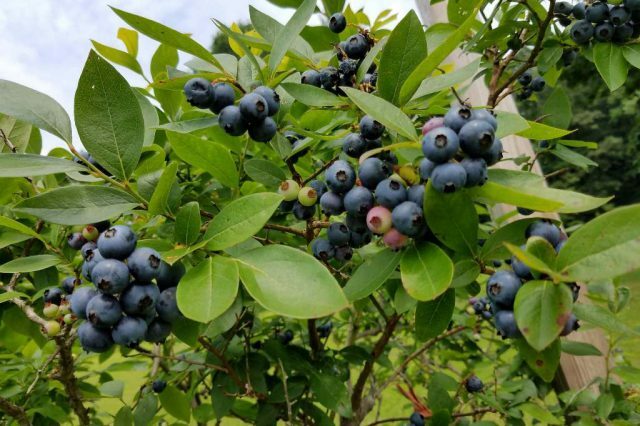 To have blueberry bushes would be amazing! 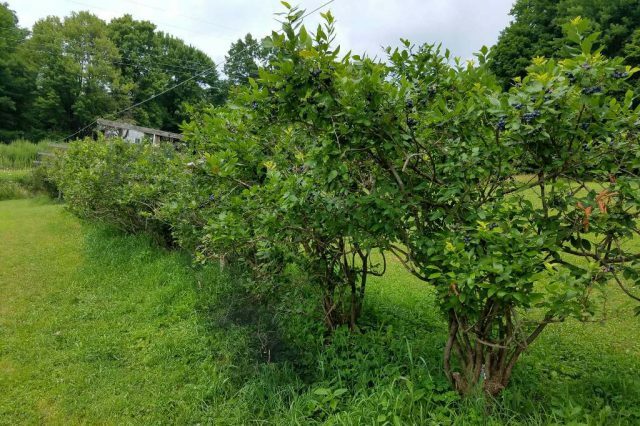 Not the Boss – we always netted our bushes until this year. We just didn’t get a round tuit and then our friends told us about bird tape. They gave us a short section as a sample and I cut it into short lengths that I clipped on the bushes with clothes pins. That was all we did this year and it worked. Mostly. We did order the tape and my intent is to use it correctly by putting a strand around the bushes next time. Oh, it was much nicer to pick without netting! I really like this idea! We hope to experiment with it! Blueberry jam, blueberries in smoothies/shakes, blueberries in baked oatmeal, blueberry muffins eaten as cereal and blueberry pancakes (the bomb!) are some of our favorites. Here’s a (non affiliate) link for the bird tape. Or scare tape. I love blueberry desserts. I have a thank you pie filling that I worked on until I finally liked it. It is 1/4 c. white sugar, 1/4 tsp. salt, 1 c. water, 3 Tbsp lemon juice, 1 Tbsp lime juice, 1/4 c clear jel, 1/2 water, 2 Tbsp. blueberry jello, 1/2 c light Karo, and 2 c. blueberries. I often add more. Heat water, sugar, salt, lemon and lime juice until sugar is dissolved. Make paste with clear jel and 1/2 c. water. Stir into heated syrup and bring to a boil. Remove from heat. Add karo and jello. If blueberries are frozen, add in immediately. If using fresh blueberries add when filling is cooled. This makes a great blueberry delight dessert, which is what i use it for mostly. Thanks for all the blogs that you write that I do not respond to. I enjoy them a lot. Isn’t it great to not have to work with a boss but still have someone in charge? That sounds delicious – thank you! And you’re welcome. 🙂 Your last question makes me laugh. Love you. My in-laws have a PVC framework over which the bird netting fits. Their bushes are NOT as big as yours, though, so I don’t know how that would work. The scare tape sounds like a winner. Mix 21 cups blueberries, 6 cups water, 7 TB lemon juice, and 1 1/2 tsp almond flavoring. Separately mix 3 cups sugar, 2 cups brown sugar, 1 3/4 cups instant clear jell, (I use 2 cups) and 1 tsp. salt. Add to blueberries and let stand 10 minutes. Fill jars and can with water bath 10 minutes. Super simple and yummy! I almost forgot one of our favorites. I like replacing the rhubarb with blueberries in my recipe for rhubarb custard bars. It beats rhubarb hands down! I’m fighting off envy. And not succeeding. We tried planting blueberries so that 50 years from now, the home owner will thank God. But we failed miserably. Now I just grow red raspberries which think they are weeds and give us buckets of fruit each summer. But red raspberries aren’t blueberries. Bless you – don’t be jealous. (As if that helps.) 🙂 Blueberries are notoriously hard to start, and for my part I can’t grow much in the line of red raspberries… 🙁 Too bad we don’t live closer and could swap a few buckets. Boss, we use mesh netting that is placed on extenders built on the ends of the rows. Thus the mesh doesn’t rest on the black raspberry bushes. We roll the ends of the mesh in wood pieces to keep it close to the bushes and tight on the ground. When I pick, I enter under the mesh, wearing my husbands golf hat! ? We’ve had a visitors, too..female oriole (fatal move). And I’ve chased out robins, tufted titmouse, a squirrel, and a chipmunk! So the mesh isn’t tight..we’ve decided to buy new mesh for next year. The bird tape mentioned sounds easy, if it works! Blueberry Dutch Baby via Averiecooks.com on Pinterest! So good! I tried the pie filling! ?? Only I blended step 1 cause I didn’t want to throw away even a little bit of pulp. I had to Buy my berries. ? Put blueberries in 8×8 pan. Mix together next 4 ingredients and layer on top of berries. Drizzle with melted butter. Bake 30 min at 350. Serve with whipped cream for a yummy breakfast. Or do like we do and trade the whipped cream for homemade yogurt for an even yummier breakfast. This is so good the little bit that’s leftover is even great for a snack at room temp without any toppings. Don’t ask how I know this. And yes yes yes! to the burnt blueberries.